The first collection of stories Stephen King has published since Nightmares & Dreamscapes nine years ago, Everything's Eventual includes one O. Henry Prize winner, two other award winners, four stories published by The New Yorker, and "Riding the Bullet," King's original e-book, which attracted over half a million online readers and became the most famous short story of the decade. "Riding the Bullet" is the story of Alan Parker, who's hitchhiking to see his dying mother but takes the wrong ride, farther than he ever intended. In "Lunch at the Gotham Café", a sparring couple's contentious lunch turns very, very bloody when the maître d' gets out of sorts. "1408" is about a successful writer whose specialty is "Ten Nights in Ten Haunted Graveyards" or "Ten Nights in Ten Haunted Houses", and though Room 1408 at the Dolphin Hotel doesn't kill him, he won't be writing about ghosts anymore. And in "That Feeling, You Can Only Say What It Is In French", terror is déjà vu at 16,000 feet. Whether writing about encounters with the dead, the near dead, or about the mundane dreads of life, from quitting smoking to yard sales, Stephen King is at the top of his form in the 14 dark tales assembled in Everything's Eventual. Intense, eerie, and instantly compelling, they announce the stunningly fertile imagination of perhaps the greatest storyteller of our time. The complete list of narrators includes Becky Ann Baker, John Collum, Boyd Gaines, Peter Gerety, Josh Hamilton, Arliss Howard, Judith Ivey, Stephen King, Justin Long, Oliver Platt, and Jay O. Sanders. 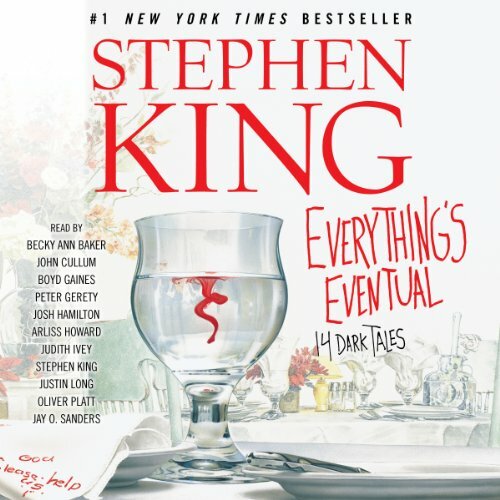 I bought this audio book because I enjoy listening to Stephen King narrate his work. I've listened to all the novels he has narrated so far, and now I'm on to the short stories, starting with this one. I was not disappointed. LT's Theory of Pets was a live reading, and it was enjoyable, though it was a little strange hearing this live recording sandwiched in between studio performances which had better sound quality. Justin Long was the perfect narrator for Everything's Eventual, which ended up being my favorite tale. The sheer variety of these great stories - which range from gruesome horror tales to hardboiled crime narrative to literary poignancy - should be enough to recommend this title, but on top of that each story has a different reader (all recognizable voices of famous actors), and each reader seems somehow especially suited to the story in question. If "Autopsy in Room 4" doesn't grab you right away and hold you spellbound in horrified fascination, then I don't know what will! who ever is responsible for the audio version of Stephen King books, please stop with the musical breaks! they are distracting; and some times continue over the narrator. in 1408 (read by King) the first several sentence are nearly obscured by the music. I like the book overall, some stories drag a bit. A great book for the beach or beside the pool. Absolutely would recommend this title. I listened to it while on vacation and some of these tales will haunt me ever after. This was a collection of short stories. Everything's Eventual, the title story about a geek with an unusual ability to create deadly emails, was brilliantly told, unfolded. The story about the boy trying to hitch-hike to a neighboring town to visit his sick mother presented that character with an unthinkable choice. The one about the road virus was terrifying. All of the stories included were good. Some interpretation of the characters, I suppose. Hearing someone read to you is comforting and ensures comprehension, narrators in this collection were not intrusive and did a good job of interpreting the characters. If you could take any character from Everything's Eventual out to dinner, who would it be and why? The email writing geek. I want to hear more about the glyphs he can construct. A few great, some good, a lot mediocre. Stephen King is by far one of the greatest writers of our time. I don't believe he is just a horror writer either. His characters are often complexly human in a way that most writers struggle to articulate. That being said, most of the stories in this book are just average. However, average at Stephen King standards it's still worth a listen if you're a fan. There are a few great short stories in this collection. Only, far fewer than I had hoped. For all your dark tales, why not the king? Extraordinary tales from an extraordinary storyteller. King wastes no time with the small details, he draws you in with amazing narratives. Each of narrators draw you in with precise diction and real emotions. What did you love best about Everything's Eventual? I like King's novella's they display some of his best work. He doesn't go overboard with detail or setting a scene. He actually lets you end his stories yourself through lack of full disclosure and information. Most memorable character was the crazy matrè'd in the story regarding the divorce. There are many narrators but I do not like King as a narrator. It's his voice it doesn't seem to have the ability for convincing me he is no more than a reader of a story so it takes longer to figure out characters. His voice doesn't give enough of a differentiation between characters. If you could rename Everything's Eventual, what would you call it? My new title would be, "IT COULD HAPPEN". loved it ! narrators are spot on with each story . especially liked Justin Long's reading. Every story in this collection is entertaining, all of the narrators give good-to-great readings, and the stories are varied and well-written. Loved it ! Stephen King deserves a special seat at the round table of great writers. He has a special genius. 1408, autopsy, ride the bullet, the picture . Thoose inremember and of course the little story roland the gunslinger from the dark tower .